One of the most tedious aspects of migrating a website is ensuring that the internal hyperlinks are all amended so that they point to the correct internal content, rather than remaining linked to the old source website. If you have a significant number of pages to work through, it can take a very long time to ensure you’ve tracked down every last link. Visitors to your website will quickly become frustrated by broken links. Search engines also take a dim view of them. Fortunately, the WP Site Importer plugin has a feature which will automatically correct your hyperlinks, which means that you save time and don’t have to deal with the frustration of correcting them by hand. There are no configuration options necessary for this feature. Simply select the Update Links menu option. 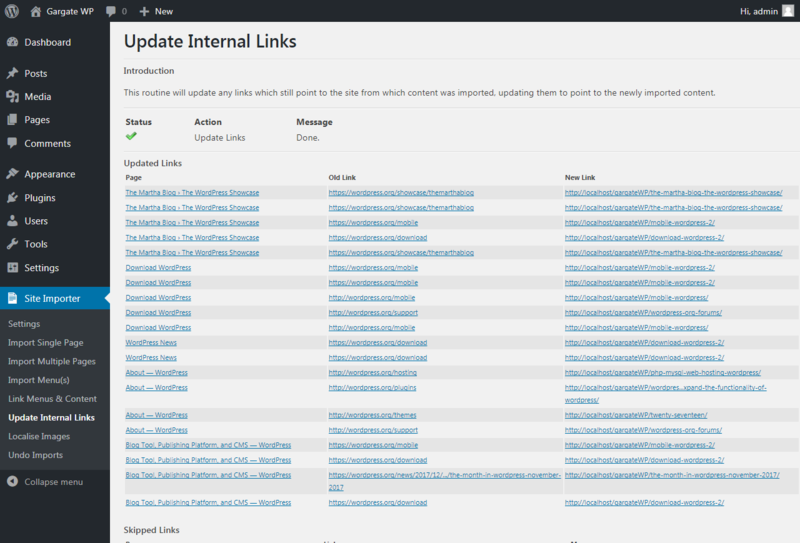 A summary of all hyperlinks updated and any that are skipped will be displayed. You can re-run this feature at any time. Where links have already been updated, this will be highlighted on the summary results.